Pressure-induced transitions are associated with near 2-fold volume expansions. While an increase in volume with pressure is counterintuitive, the resulting new phases contain large fluid-filled pores, such that the combined solid + fluid volume is reduced and the inefficiencies in space filling by the interpenetrated parent phase are eliminated. In a newly published study, researchers from the Argonne National Laboratory detail how they seemingly defied the laws of physics, using hydrostatic pressure to make dense materials with interpenetrated atomic frameworks into novel porous materials. Lemont, Illinois – When you squeeze something, it gets smaller. Unless you’re at Argonne National Laboratory. At the suburban Chicago laboratory, a group of scientists has seemingly defied the laws of physics and found a way to apply pressure to make a material expand instead of compress/contract. Because this behavior seems impossible, Chapman and her colleagues spent several years testing and retesting the material until they believed the unbelievable and understood how the impossible could be possible. For every experiment, they got the same mind-bending results. This discovery will do more than rewrite the science text books; it could double the variety of porous framework materials available for manufacturing, health care and environmental sustainability. Scientists use these framework materials, which have sponge-like holes in their structure, to trap, store and filter materials. The shape of the sponge-like holes makes them selectable for specific molecules, allowing their use as water filters, chemical sensors and compressible storage for carbon dioxide sequestration of hydrogen fuel cells. By tailoring release rates, scientists can adapt these frameworks to deliver drugs and initiate chemical reactions for the production of everything from plastics to foods. “This could not only open up new materials to being porous, but it could also give us access to new structures for selectability and new release rates,” said Peter Chupas, an Argonne chemist who helped discover the new materials. The scientists put zinc cyanide, a material used in electroplating, in a diamond-anvil cell at the Advanced Photon Source (APS) at Argonne and applied high pressures of 0.9 to 1.8 gigapascals, or about 9,000 to 18,000 times the pressure of the atmosphere at sea level. This high pressure is within the range affordably reproducible by industry for bulk storage systems. By using different fluids around the material as it was squeezed, the scientists were able to create five new phases of material, two of which retained their new porous ability at normal pressure. 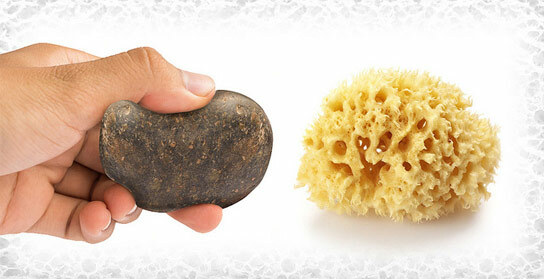 The type of fluid used determined the shape of the sponge-like pores. 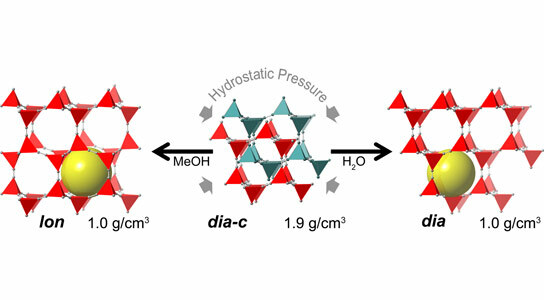 This is the first time that hydrostatic pressure has been able to make dense materials with interpenetrated atomic frameworks into novel porous materials. Several series of in situ high-pressure X-ray powder diffraction experiments were performed at the 1-BM, 11-ID-B, and 17-BM beamlines of the APS to study the material transitions. The scientists will continue to test the new technique on other materials. The research is funded by the U.S. Department of Energy’s Office of Science. Be the first to comment on "New Material State “Defies” Laws of Physics"